WebSiteSniffer - Captures all Web site files downloaded by your Web browser while browsing the Internet. Fixed bug: DNSQuerySniffer failed to remember the last size/position of the main window if it was not located in the primary monitor. Fixed bug from version 1.71: DNSQuerySniffer crashed when selecting loopback interface or other network interfaces without connection information. Added "Don't Delete Items On Capture Start" option (Under the Options menu). Added TEXT column for TEXT records. Added 'Quick Filter' feature (View -> Use Quick Filter or Ctrl+Q). When it's turned on, you can type a string in the text-box added under the toolbar and DNSQuerySniffer will instantly filter the DNS table, showing only lines that contain the string you typed. Added 'Show Only Failed Queries' option (Under the Options menu). Added option to add the DNS queries into a log file (Comma-delimited or tab-delimited file) in the 'Advanced Options' window. DNSQuerySniffer now automatically loads the new version of WinPCap driver from https://nmap.org/npcap/ if it's installed on your system. Added new option: Show only records of the specified domains/host names (In 'Advanced Options' window). Added new option: Don't show records of the specified domains/host names (In 'Advanced Options' window). DNSQuerySniffer now tries to load the dll of Network Monitor Driver 3.x (NmApi.dll) according to the installation path specified in HKEY_LOCAL_MACHINE\SOFTWARE\Microsoft\Netmon3. This change should solve the problem with loading the Network Monitor Driver 3.x on some systems. When using WinPCap driver , DNSQuerySniffer now displays more accurate information in the adapters list of the 'Capture Options' window. Added option to capture DNS queries on loopback address (127.0.0.1), available in raw sockets capture method. Added 'TTL Display Mode' option, which allows you to display the TTL value of every DNS response. Added 'Copy Host Names' option. DNSQuerySniffer now allows you to automatically add it to the allowed programs list of Windows firewall when starting to capture and remove it when you stop capturing. This option is needed when using the 'Raw Socket' capture method while Windows firewall is turned on, because if DNSQuerySniffer is not added to Windows firewall, the incoming traffic is not captured. 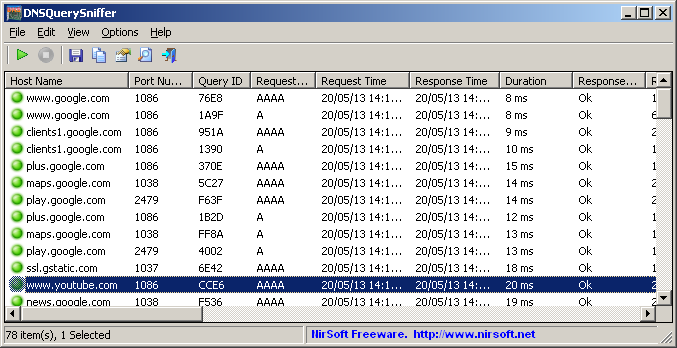 Added 'IP Country' column, which displays the country of the IP addresses found in the A records of the DNS response. Requires to download Ip-To-Country database file separately. See the 'IP Address Country/City Information' section for more information. Added option to choose another font to use on the main window. Added 'Source Address' and 'Destination Address' columns. DNSQuerySniffer is also available in other languages. In order to change the language of DNSQuerySniffer, download the appropriate language zip file, extract the 'dnsquerysniffer_lng.ini', and put it in the same folder that you Installed DNSQuerySniffer utility.